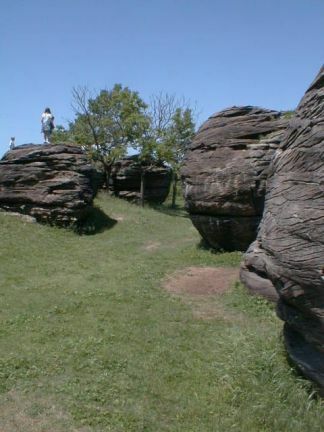 The rocks as Rock City are huge sandstone concretions. 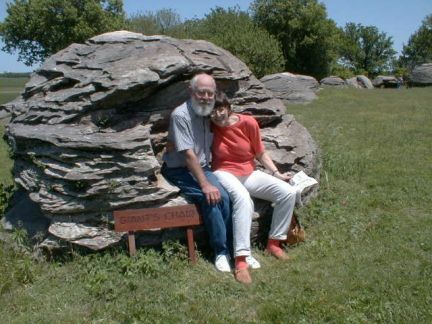 In an area about the size of two football fields, 200 rocks--some as large as houses--dot the landscape. There is no other place in the world where there are so many concretions of such giant size. Owned by a local non-profit corporation, the site is operated as a public park. Open 9AM to 5 PM daily, May 1 to September 1. Admission is $3. /adult and $. 50/child. 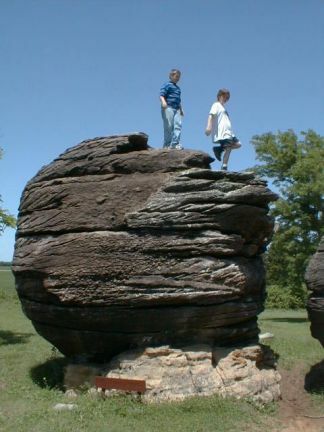 Geologists are in general agreement these concretions were formed millions of years ago of Dakota Sandstone, which was deposited when an Inland Sea covered areas of Kansas. This alley is between some really large rocks. This shade tree and picnic area separates the smaller concretions from the monster rocks further west. Some grade school kids had been hearing a science lecture. When it was over, they went wild. Two boys had somehow scrambled atop this enormous rock. The kids really enjoyed climbing on these huge rocks. Max and I posed for our picture in the "Giant's Chair." extra large grain of sand served as a nucleus. It continued outward in all directions from these centers. The result was the formation of a number of spherical bodies of tightly cemented sand grains scattered from the sandstone mass. Had the cementation continued long enough, the spheres would have grown together and the huge rock would have become a homogenous mass. But before this could take place, erosion by wind, rain, wash and running water began to lower the surface. Of course, the loosely cemented sand was the easiest to carry away, so it went first. The concretions resisted the erosive activity, so were uncovered and left lying on top of the present surface. There are other examples of these phenomena throughout the world, but none are as unique or large as here. I get a number of e-mails about this site, and must explain I'm a visitor to the park only . I can't answer questions about Rock City. I suggest people visit the official Rock City page for contact connections. My grandparents lived in Minneapolis, KS, when I was growing up, so Rock City is a big part of my family history and a place dear to my heart. I have photos of generations of my family sitting on these rocks...back to my great grandmother. I hope to add some of those old photos to my site someday -- much like I've added my grandfather's photos of his Kansas Wesleyan college geology class visiting Mushroom Rock State Park, west of Brookville, KS. This Rock City page is a part of some grade school curriculums. It gets lots of visitors, which pleases me. 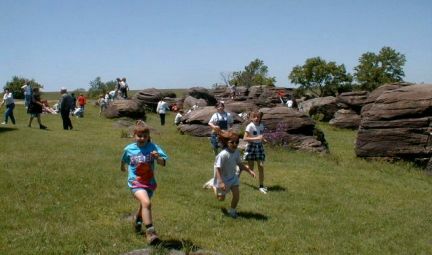 The site is popular because it shows school children enjoying the rocks. The day we visited we had good weather, with school buses parked and kids sitting around a park lecturer in a grassy area near the visitors' center. We strolled among the rocks, leaving the school group behind. At one point the adults let the kids go exploring. 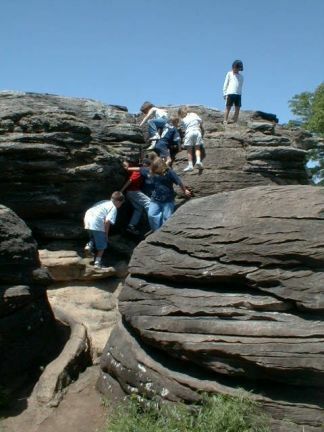 The kids went nuts -- racing to the rocks, scrambling around over the surfaces. Their enthusiasm is contagious! 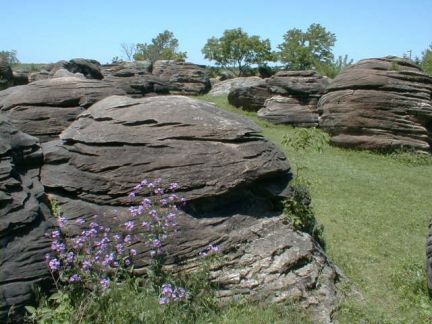 Rock City is owned and operated as a park by Rock City, Inc., a local non-profit corporation. It is open 9 a.m. to 5 p.m. daily, May 1 to September 1. A small admission fee is charged and used to maintain the park and offset its operating costs. 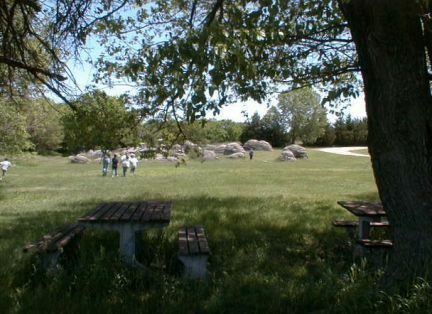 Further information about Rock City can be obtained from Rock City, Inc., 1051 Ivy Road, Minneapolis, Kansas 67467 (785.392.2577).